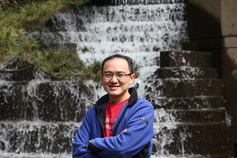 Research Summary: I was focused on cancer research when I started my career in Taiwan. My main goal was to screen potential anti-cancer drugs from the extracts of herbal medicines and to study their roles in signal transduction in tumor differentiation. After joining Rossi Lab, I involved more in vivo work on animal research, including surgery, and work cooperatively with lab members. Currently I am working on screening potential compounds that would affect FAP proliferation and differentiation. I like to enjoy life with family and friends. I also enjoy outdoor activities, like hiking, camping, traveling and photography.